While searching Amazon for healthy Halloween candy options on Amazon, I was disappointed. It was so hard to find options without artificial colors, corn syrup, and hydrogenated oils! Not to mention, when I searched Google for “healthy candy swaps” the focus was always on calorie count or grams of fat. When it comes to dental health, don’t let these things be a guide. There are plenty of low-cal, low-fat candies out there that can wreak havoc on teeth. By knowing how candy actually affects the teeth, you can help steer your family toward better candy choices. Gummy worms: because they’re the most acidic. Acid is bad for your teeth because it wears down the tooth enamel, which protects your teeth. This makes it easier for teeth to become chipped or broken. Enamel also insulates the tooth. Damaged enamel can expose the nerves in your teeth, which are extremely sensitive to changes in temperature of the things you eat and drink. Chewy or sticky: The stickier the candy, the worse it is. The effects of these sticky candies will linger because they stick around, increasing the chance for a cavity. The same goes for dried fruit, which is just as bad for your teeth because of the stickiness and concentration of sugar. Stick to real fruit, which is far less concentrated in sugar and is packed with fiber and water that keep you full. Hard candy: That’s because when it comes to how bad a candy is for your teeth, frequency of exposure is more harmful than quantity. If you eat the candy quickly and brush your teeth and it’s over very quickly — as far as your teeth go (not talking about blood glucose systems and the effect on the rest of the body) it’s much better than sucking on a candy all day long, like in the case of a lollipop. Frequency of exposure increases chance of harm to teeth – but if you throw it down the hatch and brush and floss right after, damage to (teeth only) can be minimal. There are lots of organic lollipops without artificial colors that you won’t see me recommending for this reason. Better to be down the hatch quickly! Anything with nuts: Think Payday bars or Peanut M&M’s. Nuts and nut butters like peanut and almond butter help to break up the stickiness and the fiber and fat in nuts can help satiate. Chocolate and nuts are always better than the fake fruity junk! My favorite “candy bar” which I’ve found to be tastier than my old favorite Payday and extremely low in sugar — around 5 to 6 grams depending on the flavor — are the KIND bars. My favorite flavor is Dark Chocolate Nuts & Sea Salt. Dark chocolate: Lower in sugar, Raise your kids to appreciate the taste of real dark chocolate, instead of junky milk chocolate! Plus, dark chocolate is a superfood and has properties that may help remineralize teeth. While shopping for candy (or any food for that matter), make sure your kids see you read ingredient labels. If they see you do this, I promise they’ll start doing it in adulthood. As parents, I believe one of the most meaningful gifts we give our children is the habits they carry with them into adulthood—and reading the ingredients label is a habit that will add years to their life and life to their years. Here are some of the most common “must-know” ingredients you’ll see in Halloween candy. These are always bad, in any quantity. Add these to your “never” list and make sure your kids know why. Corn syrup, which even in moderation is a major cause of heart disease, obesity, cancer, dementia, liver failure, tooth decay and more. TBHQ, an additive to preserve processed foods, which is linked to ADHD in children and has caused liver enlargement and neurotoxic effects in laboratory animals. Partially hydrogenated oils, a trans fat that increases risk of heart disease with the double whammy of both raising bad cholesterol and lowering good cholesterol. The American Heart Association suggests limiting trans fats to less than one percent of your total calories. Fill them up with their favorite meal before trick or treating starts. A fatty, filling meal with protein and a slow-burning carbohydrate. If you want to be extra sneaky, make something that’s your child’s favorite so they start off trick-or-treating already feeling satisfied. Also, after a meal, there’s more saliva in the mouth, which will help protect your child’s teeth against the acid attack from the candy. Bring lots of water with you! 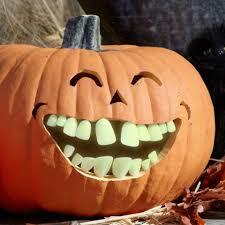 Your kids’ teeth are going to be bathed in acid from all that candy, and water helps buffer the acid attack. The best part? Your kids will be thirsty from eating all that candy, and will be relieved you thought to bring water. Here’s a tip if you get trick-or-treaters: Keep mini water bottles on ice in a cooler and pass them out chilled. Try it and I promise you’ll be a favorite house on the block—the chilled water will re energize both kids and parents and keeps everyone going! Don’t forget the magic of the Great Pumpkin! This is a fabulous tradition that my wife and I thoroughly enjoyed with all three of our daughters. The Great Pumpkin works just like Santa Claus or The Tooth Fairy—let your kids indulge Halloween night, and have them put their leftover candy at the front door. The Great Pumpkin flies through the skies Halloween night and replaces bags of candy with a gift—a new game, clothing, or colored pencil set perhaps. I’ve also heard of this same concept being called “The Switch Witch.” Choose something that works for your family and your kids, and make the tradition your own. Demonstrate moderation yourself. As a father, this has always been my hardest lesson. My girls were never as likely to do what I would say, as they were to follow my example—especially as they got older. Indulge in some candy, practice good habits, and above all, don’t give candy value it doesn’t deserve—don’t participate in dentist buyback programs or make candy a reward for good behavior. Kids pick up on this and psychologically we don’t want them to see candy as something of value. Use leftover candy for science experiments: Did you know you can use leftover candy for science? We never did this with our girls, but if we’d known about it, we would have! If you search Google for “leftover Halloween candy science experiments” there are tons of great ideas. Don’t brush right after: It may be counterintuitive, but you want your kids to drink plenty of water and wait at least 30 to 45 minutes after a candy binge before brushing. The acids in candy temporarily weaken enamel, and brushing right after will irreparably damage that enamel. I want to be very careful not to oversimplify cavities and sugar. The mouth is a complex ecosystem of microorganisms. Eat the wrong foods, and you throw this delicate ecosystem out of whack, making you more prone to bad breath, gut, heart, and brain health disturbances, and yes, more cavities. This is why I like to say, what happens in the mouth, happens in the body; your oral health impacts virtually every other system in the body! There are many more implications to all this sugar than just a hole in the tooth. Your tooth is a live organ, constantly losing and regaining minerals, like dollars flowing in and out of your bank account. Losing minerals is natural, but when the tooth can’t regain minerals faster than it loses them, you get a cavity, or, to use the bank account analogy, a “deficit” in funds. Sugar also doesn’t just impact oral health; it impacts overall health too. New research is starting to find that our levels of sugar consumption are making sugar a toxin that could be a driving force behind many diseases, such as heart disease, diabetes, Alzheimer’s, and breast, endometrial, and colon cancers.